Stop Words is an addon for Post Pay Counter and allows you to specify a list of words (stop words) that should not be counted when computing posts word count. When we say that stop words will not be counted, we really mean that: it will just be as if they didn’t exist at all! 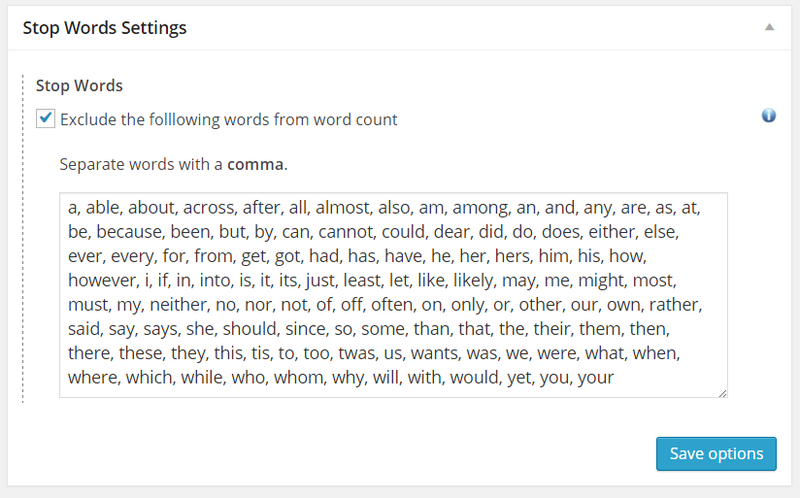 Stop words are automatically subtracted from word count so that the stats table always displays the correct word number. You can specify different stop words for different users, and even activate/deactivate the feature for some of them. First of all, make sure you have the latest release of Post Pay Counter installed and active. As soon as you purchase the addon, you will get an email with the download link and your license key: download the plugin through that link, extract the zip and upload its content (the whole ppcp-stopwords folder) to your WordPress wp-content/plugins folder. Now head over to your website plugins list page, look for Post Pay Counter – Stop Words and activate it. Finally, go to Post Pay Counter > Options > License status, paste your license key in the apt field and hit Submit. You’re done: your license has been activated and you can now enjoy all the new features, which you may set up in the Stop Words Settings box (after refreshing the Options page).